A judge in Maine Wednesday ruled that outgoing Gov. Paul LePage must implement an expansion of Medicaid passed by voters last year. LePage refused to implement the law which was approved by nearly 60% of Maine voters in Nov. 2017 and was supposed to have gone into effect July 2. Maine Superior Court Justice Michaela Murphy ordered LePage to comply by Dec. 5. "Although the Governor may believe implementation to be unwise and disagree with the Act as a matter of policy, he may not ignore the will of the people and refuse to take any action toward accomplishing the policy objectives of the Act," Murphy wrote in the 21-page opinion. The order directs the state to reflect an effective coverage date of July 2, 2018, potentially making anyone who had been denied coverage after that date eligible for reimbursement of any out-of-pocket expenses incurred. LePage had argued that the state could not properly fund the expansion, which would cover an estimated 70,000 people in Maine and cost about $55 million a year. However, Maine's Governor-elect, Janet Mills, the state's Attorney General, had said it was her priority to implement after she took office in January. 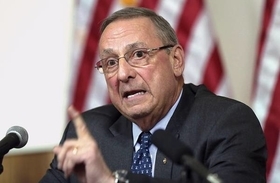 LePage's office told local papers that the governor planned on appealing the decision.